Getting ahead in business today involves more than just expertise. It involves presentation and salesmanship, strategic positioning and knowing your audience. It takes marketing. That’s just as true at the individual level as it is at the corporate level, which is why a master’s degree in business administration with a concentration in marketing is like a two-for-one deal for ambitious executives: you get the skill set you need to take your career performance up a notch at the same time as you get the expertise to help a business succeed in marketing and sales. You can’t get that kind of full-spectrum education just anywhere, though. Marketing may be one of the most common concentrations offered in American MBA programs, but not all of those programs, or concentrations, are created equal. Ironically, it’s marketing that makes it hard to tell which of those programs are the best. Any school today can put up a killer website and farm links to get a good search ranking without putting a dime into the substance of their program. That’s why we’ve gone out and sorted through all the collegiate sales pitches and cut through the glossy website graphics to get you the real scoop on the top MBA marketing concentrations in the country. How do we know they’re the best? Well, it’s because we took the time to dig deep and look at both the school and the program itself. And where we started the process was by looking at the levels of accreditation that they had been granted. Accreditation in the United States comes at a few different levels. You probably already know that any university worth looking at holds regional or national accreditation from one of the major accrediting bodies recognized by the CHEA (Council for Higher Education Accreditation) or the U.S. Department of Education. These are all particularly important when it comes to marketing concentrations, because the field is evolving rapidly in response to online media migration and developments in data analysis. If you’re looking at adding a marketing concentration to your MBA, you’d better be looking for a cutting edge program, and giving consideration to specialty accreditation is one way to help you find it. Even after you cut away all the unaccredited programs, though, there’s still a big pile of marketing concentrations left to look at. So we cut it down even further to make sure only the very best made it onto the list. We paid particular attention to schools that incorporated strong courses on digital marketing into their concentration track. It’s well known that online and offline advertising spending is fast becoming equal… with the online component growing fast. It’s not Mad Men out there anymore… any MBA graduating in the next few years who goes into marketing is going to spend far more of their time putting together slick online and social media campaigns than working on magazine layouts or even TV spots. So we picked schools that are already pioneering new digital marketing techniques, and they got extra points if professors or on-campus centers engage in active research in the area. And we didn’t pick a program unless it offered at least some online class options… if someone is going to be teaching you about Internet marketing, it’s a bad sign if they can’t figure out how to set up a basic digital classroom! Another crossover effect from the digitalization of mass media is an increasing access to global markets. So we also looked for schools that offer courses abroad or other ways to offer students exposure to other cultures. Crafting marketing messages that resonate in multiple cultures is an art form, and it’s one you only master with familiarity. Your graduate program is a place to get a head start on that. Finally, we took a close look at the core MBA curriculum, all the accounting, strategy, and HR nuts and bolts that go into the operation of any business. Marketing is only a part of the puzzle, and as an executive in branding and sales, it’s vitally important that you can tie together your message with the capabilities and imperatives of the underlying business operation. That leads us to the list below… the finest MBA marketing concentrations in the country, laid out for your consideration. Ashford University’s MBA in Marketing focuses on advanced marketing topics like branding, research, and consumer behavior to ensure a well-rounded and robust graduate course of study. In addition to a rigorous and comprehensive MBA core, you’ll dive deep into areas like marketing management, forecasting, statistics, and marketing and media strategies that will allow you to propel your career to leadership positions in corporate, nonprofit, government, and other marketing environments. Best of all, you’ll complete this innovative program entirely online through the university’s virtual classroom. It’s here where you’ll engage and collaborate with your classmates, receive instructor resources and feedback, manage your calendar, and receive 24/7 technical support. Plus, as an online student, you’ll have full access to Ashford’s team of Career Specialists who are there to provide you with everything from one-on-one coaching and support to customized career planning. As a new student, you’ll even have access to a CHAMPS peer mentor—high-achieving students who are there to help you succeed. Ashford University is accredited by WASC Senior College and University Commission (WSCUC), 985 Atlantic Avenue, Suite 100, Alameda, CA 94501, 510.748.9001, www.wscuc.org. Post University prepares you for a successful career as a marketing executive through intensive communication and marketing skills education. You’ll get the latest on using marketing research, technology, and advanced analytics to quantify your marketing efforts and gain insight into brand initiatives and campaigns. With a course in consumer psychology and buying motivations, you’ll get the tools you need to unravel the numbers that modern sales and ad tracking systems provide and to turn the results into actionable and successful conversion programs. With faculty and staff committed to providing a personalized approach to your education, you’ll have no trouble getting through the Post MBA and getting the credential you need to advance your career out in the real world. Wilmington University’s MBA in Marketing Management features: a fully online curriculum, an esteemed faculty of active practitioners, a collaborative environment of like-minded professionals, and accelerated, seven-week courses that are designed to accommodate your busy, professional life. In addition to a robust and comprehensive MBA core, you’ll complete advanced courses in marketing like market research and consumer behavior, business to business/government marketing, and integrated marketing communications. Plus, you’ll have access to Wilmington’s Career Services, a free resource that includes assistance with your career plans. Barry University stresses the analytical approach to marketing. You’ll learn not only the basics of market opportunity analysis, strategic development, and planning, but also the high-level, managerial aspects of marketing. Learning to look at marketing as senior executives do, you’ll understand the psychological, sociological, and anthropological theories behind marketing techniques and you’ll see how they fit into larger business goals and strategies. Barry’s online programs and dynamic and integrate real-world experience, so you will never get caught trapped in last year’s trendy marketing buzzwords. All your training will incorporate current industry best practices and contemporary methodologies. You can go anywhere and get an MBA with a marketing concentration these days… it’s one of the most popular specializations offered by MBA programs across the country today. But if you want that extra edge, if you want something hyper-specialized and singularly focused on delivering the key skills required in one of the most competitive marketing environments in the world, you turn to the Executive MBA in Consumer Goods & Services Marketing at Jacksonville University. Working with industry giants like Pepsico, the instructors at Jacksonville have lasered in on one of the most challenging marketing environments and built a program designed to teach working executives the knack for cracking it wide open. You can expect to hit the ground running with the programs Applied Learning format, which will pair students with current industry executives and subject matter experts to get the latest information and put it together. Needless to say, this is also an excellent way to gain key networking contacts in the industry, making it a clear choice for working executives who want to get ahead in consumer goods sales, marketing, or operations. Lynn University’s online MBA program, ranked as one of the top MBA programs in the nation by U.S. News & World Report and the South Florida Business Journal, features a contemporary marketing concentration that’s designed to prepare you to assume leadership positions in communications, sales, marketing, advertising, public relations, consulting, and more. This fully online grad program features a convenient curriculum that’s designed to provide with the flexibility you need to manage your professional responsibilities while earning your MBA. As an online student here, you’ll learn from an attentive and dedicated faculty with real-world business experience while you engage with your peers through a small, virtual classroom of just 10-15 students. You’ll also be part of Lynn’s innovative iPad program (one of the most extensive in the country), which includes receiving an iPad upon admission to the program that’s pre-loaded with an outstanding selection of apps and iBooks that make the online learning process more convenient than ever before. Specificity is always a good thing in MBA specializations, which is why Saint Leo’s Social Media Marketing concentration jumps up off the list and demands immediate attention. Employers love cutting-edge skills in hot trends, and there are few trends in marketing hotter than social media today. As the clear future of the field, now more than ever businesses are desperate for executives who can decipher the memes, moments, and likes that determine success on the biggest platforms. The Saint Leo program focuses on the massive data streams coming from social media and gives you the tools to break them down together with the strategic marketing knowledge to take advantage of them. You’ll learning how to integrate the marketing-specific information you have with the traditional measures and operations of business to develop complete sales and branding programs that directly feed the bottom line. It’s a good idea to find a marketing program today that is as specialized as possible, and of all the specialties you might choose, social media is among the most immediately relevant and in-demand in today’s business world. Lewis University belies the conventional perspective on Catholic universities as conservative and traditional with a cutting-edge program focused exclusively on social media marketing considerations. From analytics to strategy, all of the concentration courses pitch the material from the modern perspective of highly networked, fast-paced social media platforms. You’ll get advanced knowledge on business intelligence and data analysis crossed with search engine optimization methods and other internet-specific marketing knowledge that other programs may cover only briefly. Choose North Park University’s outstanding MBA program and pair it with a graduate certificate in Marketing Management and you’ll be prepared to become a leader in the corporate, nonprofit and public sectors and an authority in the modern marketing process. This fully online program features a comprehensive and rigorous MBA core that covers advanced topics in finance, organizational behavior, economics, and more, while the graduate certificate in Marketing Management features an innovative curriculum of five courses that includes topics in market research, consumer behavior, position, branding, and integrated marketing communications. As an online student here, you’ll benefit from the program’s esteemed faculty, small class sizes, and streamlined curriculum that allows you to graduate in as little as 12 months. The KU B-School has a cutting-edge online MBA program that puts you in control of when and how you consume course content while still putting you into tight connection with professors and fellow students as you navigate the group-based assignments that teach teamwork along with course content. That kind of high-tech, bleeding-edge approach continues with the marketing focus area, which offers courses in consumer behavior, global marketing, and digital and social media marketing… areas that businesses are hungry for talent in. With a KU MBA in hand, you have proven expertise in exactly those areas… a sure ticket to a high-paying job in the industry when you graduate. Whether on-campus, online, or a convenient blend of both, the University of Saint Mary’s MBA in Marketing and Advertising Management will prepare adult learners like you for success through a rigorous and relevant curriculum that can be completed on your time and on your terms. In fact, Saint Mary is one of the only MBA programs in the state to offer students a seamless, unlimited transition between on-campus and online classes. As an online student, you’ll have access to the same, outstanding curriculum that on-campus students enjoy, and you’ll have the option of starting the program at five points throughout the year. Take just one class per term and you can graduate in as little as 24 months. Choose to take two classes per term and you’ll graduate in just 12 months! In addition to the program’s comprehensive MBA core, you’ll explore the most contemporary topics in marketing, such as marketing research, marketing strategies and planning, and advertising in the modern era, all within an interactive virtual classroom setting. The WSU MBA’s marketing concentration aims to provide students with the right tools to address organizational marketing issues. This happens with a blend of theory and applied business practice, analyzing marketing intelligence to build a picture of the customer base and competitive environment the business is operating in. Courses in law and ethics, operations management, and consumer decision making combine to cover these practices with the standard set of managerial finance, strategy, and accounting courses that come with the base MBA core. University consistently ranked among the most affordable Christian universities in the U.S.
Eight-week courses, a fully online course delivery, and a robust program that’s designed to prepare you to assume leadership roles in a variety of complex business settings are just the beginning of what Campbellsville University’s MBA in Marketing has to offer adult learners like you. Choose this innovative program and you’ll be part of an esteemed university that’s been consistently ranked among the most affordable Christian universities in the U.S. In addition to a rigorous MBA core that features advanced strategies and techniques in the foundational business areas, you’ll explore the field of marketing by choosing three of four marketing track electives: healthcare marketing, international marketing, marketing research, and marketing communication. Just a few areas of study include product development, consumer behavior analysis, market forecasting, and the development of marketing plans. As an online student, you’ll enjoy an outstanding learning environment that features an esteemed faculty with real-world experience, a flexible curriculum, and the option of studying whenever and wherever it’s most convenient for you. UMAss Lowell is a high-energy location in the heart of a global community, so if you’re interested in getting a finger on the pulse of national and international marketing trends and techniques, you’ve come to the right place. With courses in digital and sustainable marketing on top of the usual fare of sales and analytics courses, you’ll get a cutting-edge approach to modern marketing with this MBA option. With strong business-oriented courses in traditional accounting and managerial topics in the core curriculum, the result will give you the skills and confidence you need to take an executive position in sales or marketing in any company in any industry. Davenport University’s MBA in Marketing has everything you need to succeed: a rigorous curriculum grounded in today’s most relevant issues…an esteemed faculty who bring years of experience to the classroom…and strong partnerships with the business community. Add to that a fully online course delivery and it’s easy to see why Davenport is the home of emerging business leaders like you! Choose the 39-credit MBA in Marketing and you’ll be able to earn your MBA from the comfort of your home through convenient, seven-week classes that begin six times a year for the best in flexibility. You’ll also have access to study abroad and internship opportunities to enhance your graduate course of study. In addition to a solid MBA core, you’ll hone your marketing skills through topics like digital marketing, consumer behavior, strategic brand development and management, and integrated marketing communication strategies. UM Flint’s School of Management firmly believes in diversity as a key learning tool. That belief is reflected not only in the class composition, but in the very structure of the program, which the school calls Net+: a combination of personal interaction in face-to-face classes with an online MBA experience that offers great flexibility and convenience. It’s notable that the marketing concentration doesn’t just cover marketing, but also innovation, a quality more commonly associated with entrepreneurship focuses. But it’s exactly this unusual pairing that makes the concentration a winner; a in-depth understanding of the creative and innovative process that drives memorable and successful marketing campaigns is something this program excels at providing. You’ll find yourself well-prepared for executive positions in marketing and management with a key understanding of not only business factors but also broader market influences that other executives may fail to grasp. The Carlson MBA will teach you to use business as a force for good. That’s more important in marketing than nearly anywhere. Brand management is a notoriously difficult job, but companies that are perceived as being good and benevolent have an instant leg up on the competition. When you earn an MBA with a marketing concentration from the University of Minnesota, then, you get a leg up on your own competition for jobs in that segment… you’ll have all the strategic financial, managerial, and analytical skills that come with a top-ranked MBA degree, but also the additional ethical and positioning skills that come from an education from professors who believe in what is right over what is expedient. Scored as a Tier 1 institution by U.S. News and World Report. Caldwell’s innovative and career-enhancing graduate programs have been supporting the Catholic Dominican commitment to higher education since 1993. You can be sure that the stringent business courses offered as part of the MBA program meet with all the highest legal and ethical standards of both education and commerce. The marketing concentration includes courses on brand management, eMarketing, and integrated marketing communication, giving you all the strategies and techniques you need to develop your MBA into a strong executive position in a sales or marketing organization. Centenary University—the first institution in New Jersey to offer an accelerated MBA—offers the MBA Accelerated in Marketing, a fully online course of study that allows you to earn your MBA from the comfort of your home. This truly flexible program is also offered as an on-campus program, meeting just one evening per week, or as a hybrid program, combining the convenience of online study with on-campus meetings. Best of all, whichever format you choose, you’ll complete this program through accelerated, eight-week courses designed for busy, working professionals like you. As an online student, you’ll enjoy the same, quality curriculum that includes an MBA foundation alongside advanced marketing topics like marketing management, management information systems, and the legal and social environment of business. You’ll also receive expert guidance from an assigned program advisor who will help you create an individualized academic plan. Marketing is a core component of just about any business and MBA graduates with specialized training in branding, research, and market analysis are always in strong demand by American business. But the field of marketing has cracked wide open over the past twenty years and the tired old approaches that worked on “Mad Men” just aren’t good enough anymore. For real cutting-edge training in today’s marketing tools and techniques, you need to consider taking the specialization in digital marketing at Montclair State University. One of very few such programs in the country, it dives straight in to social and mobile media topics, e-commerce, and hyper-targeted media buys. You’ll learn about the fundamentals of markets and market research, but using new tools that weren’t available when the curriculums were drawn up for most marketing programs. The school even touches the third rail by daring to discuss the subject of returns on digital marketing investments, giving you ways to prove that what you are doing is effective. The school has a more general marketing concentration available as well, but digital is where you want to be in today’s business world. Rutgers School of Business is a hallowed name in American corporate and financial circles. An MBA from Rutgers has launched careers leading to the founding of ESPN and the presidency of Ford’s China operations. When a Rutgers MBA shows up on a CV, you can bet that piece of paper gets read all the way to the bottom. You might expect such an old and storied program to be stuck in the past, focused on the tradition and weight of finance, economics, and strategy using time-tested teaching techniques and professors with decades of experience. And you’ll get all that expertise and professionalism. But what might surprise you is the cutting edge melding of the latest digital marketing solutions with all of that tradition. It’s not Mad Men out there anymore, and a strong command of social media, trending crisis management, and mobile app ecosystems is no longer optional in the marketing world. Rutgers puts all of those things together with marketing management and analytics education to guide you down the right path to becoming a branding and outreach guru in any industry. The name gets you in the door; the education takes you to the corner office. Professionalism, ethics, and critical and creative thinking are all areas of emphasis for NMHU. At a multicultural campus in the beautiful and remote high desert of the Southwest, you get a unique perspective on modern marketing practices. It’s no accident that the MBA program is run by the School of Business, Media, and Technology—it’s a recognition that marketing is about more than numbers, and that the field has been irrevocably changed by social media and networking technologies. Informed by a diversity of ideas, you’ll be exposed to a curriculum that takes you into the details of analyzing and anticipating consumer behavior and builds your knowledge of advertising theory. With that groundwork out of the way, you’ll go into the interesting challenges of taking a managerial approach to internet marketing strategies. Together with the rest of your class, you’ll tie all of that detailed knowledge together in a capstone business strategy course focusing on a case analysis of business problems. Becoming a Bonnie for your MBA studies will not only set you up for the business career of your dreams but also will serve as a catalyst for setting you on a course to help serve the greater good. In the Marketing program track, you’ll work on that aspirational goal by studying not only the basics of economics, accounting, and organizational behavior, but also learning about consumer behavior and the legal environment in which marketing is performed. Your training will be consolidated through a case-based capstone course that provides a practical, normative, and integrated approach to management in line with the courses you’ve taken leading up to that point. St. Thomas Aquinas College’s fully online MBA in Marketing is where adult learners like you head for a truly comprehensive graduate degree that’s designed with flexibility and convenience in mind. Thanks to a flexible curriculum that allows you to plan your course load around your personal and professional obligations, you’ll be able to earn your MBA in a way that is more convenient than you may have thought possible. The online MBA in Marketing features the same courses as the on-campus program, and the quarters run concurrently with the campus classes. You’ll enjoy the best in instruction through the school’s outstanding faculty of experienced practitioners, and you’ll have access to the Office of Career Development, both as a student and alumnus, along with valuable connections through the robust STAC alumni network. Want another reason to choose St. Thomas Aquinas for your MBA? It’s been recognized as a Top-Tier Regional University by U.S. News & World Report. Entrance exam requirement: GMAT may be requested. Geneva college’s professors have real-world business experience that they combine with the school’s Christian values in their highly-rated MBA program. Integrating the Christian faith with a strong work ethic is a win/win for both students and future employers. The marketing concentration offers even more benefits. The program topics come at the subject from a high level, with discussion of business models and product theory put together with strategic considerations like brand positioning and the flow of goods. Buyer behavior and advanced marketing theory and strategies are covered in as much depth as core business subjects like accounting and human resources. Located within the esteemed Shields School of Business, which boasts small class sizes, an award-winning faculty, and opportunities for prestigious internships and study abroad experiences (including a spring break trip to London), Saint Francis University’s MBA in Marketing is the rigorous program emerging leaders like you are looking for to propel your career to the next level. A fully online course of study that features outstanding communication and collaboration and a dynamic online learning platform ensures that your distance learning experience is both interactive and productive. The asynchronous design of the program allows you to study whenever and wherever it’s most convenient, and the curriculum is the same as the on-campus program, ensuring the highest quality education. Saint Joseph’s is all about marketing in their prestigious MBA program. In addition to the healthcare and pharmaceutical specialization, they also offer one in food marketing… marketing specializations are the only type of concentration SJU offers, which tells you a lot about the focus and expertise the university has developed in the subject. In fact, they insist these degrees are more than just a concentration—you are getting a specialized MBA revolving around marketing considerations in pharma, biotech, medical devices, diagnostics, and healthcare. With the unique factors that make up the American healthcare industry, that sort of hyper-focused, laser-like intensity drilling down into elements like patients, payers, and providers is exactly what you need to be successful. The pharmaceutical and healthcare marketing MBA is a degree for leaders, and SJU puts together a set of information and tools that will punt you right to the top of your organization in healthcare marketing. Pitt provides a business education to be reckoned with through the Katz Graduate School. The leadership and research skills offered by the top-notch faculty there are second to none in U.S. business programs. A Pitt MBA on your resume opens doors at any Fortune 500 company in the United States… which probably already has a few Pitt grads among its executive ranks. But the program is more than just a name. With extensive research in branding and digital marketing at the respected Center for Branding, you’ll have exposure to cutting-edge explorations in marketing research and techniques. And you don’t have to wait until the end of your term of study to dive into your specialty, either. You’ll have the opportunity to start taking concentration-specific courses as soon as your second term. With a wealth of elective options in consumer behavior, marketing planning and strategy, sales management, and analytics, you can customize your specialization in a way that few other MBA programs can match. Most marketing concentrations cover a general range of topics and sales and branding knowledge… good stuff to know for MBA students headed for a career in sales and marketing, but not exactly everything you need to succeed in every field. For some businesses, marketing has its own special demands and rules, a separate set of tips and tricks that no generic marketing concentration will ever fully cover. For the sporting industry, though, Winthrop University has got you covered. With in-depth courses on branding and merchandising, development and sales, and business analytics, all specific to the sporting environment, you’ll graduate with a strong grasp of how different sports marketing is and with the tools to build out a brand and generate revenue in the real world. Union’s marketing concentration offers MBA students an in-depth understanding of the tools, concepts, and practices of modern marketing efforts. In a constantly changing world where trends and online memes appear and disappear at a lightning pace, Union’s Digital Marketing and Consumer Insights courses are must-views for aspiring marketing professionals. You will get the same exposure as any MBA student to accounting and organizational business strategies, but selling strategies and strategic marketing techniques add depth to your executive expertise. A strong emphasis on experiential learning processes also means you’ll be involved with faculty research projects working with real business programs or paired with companies to consult on real-life projects for further experience. Every B-school in the country will offer you pretty much the same courses in accounting, marketing, strategy, and HR topics as part of the off-the-shelf MBA program. Most of them leave you to figure out all the other critical elements of professional success on your own… how to dress, speak, and live in a way that will transform you into a strong, motivated leadership figure in business and in life. Driven by the Fogelman Professional Development Center, the University of Memphis MBA doesn’t have that problem. Here, you’ll get instruction in ethics, health, and other critical factors that don’t make the curriculum in other places. You’ll have the same up-to-date digital marketing and sales courses but you’ll also get the polish and presentation that are required to really succeed in marketing and sales, which is why this program makes our top list of marketing MBA concentrations. Named #36 Best Online MBA in the country for 2018 by U.S. News & World Report, and #7 for affordability! As one of the most affordable MBA programs we’ve ever seen, West Texas A&M offers an amazing value for students looking to specialize as marketing or sales executives. In fact, Online U rates the marketing concentration as the #1 most affordable graduate marketing degree in the country for 2018. For a professional looking to get into a world where margins and commissions will be king, finding value and reaping the benefits is a high priority. So low costs aren’t the only thing you care about—you also want to make sure you are getting the latest and best education for your dollar. There’s no worries at West Texas A&M on that score. You’ll get up-to-date training in evolutionary marketing and social media marketing, cutting edge techniques that will get you in the door at any business in the country. 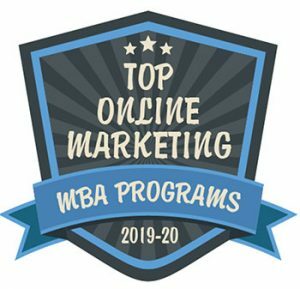 City University is consistently ranked among the top MBA producers in the state of Washington by local business publications, so it’s no surprise that their global marketing emphasis is also one of the best marketing concentrations available among ACBSP-accredited schools. A global management emphasis at the university helps tell you how important the “global” part really is… City is serious about turning out graduates who are capable and adept at moving in the international business world, conducting trade at home or overseas. In marketing, that means developing firm multicultural perspectives on strategic brand creation, building brands that work across national, language, and cultural boundaries. An internship option places students in firms with international exposure to gain on-the-ground experience with global marketing and integrated communication. Online learning has never been easier than it is through Concordia University Wisconsin! Online or on-campus, full-time or part-time…the choice is yours through Concordia’s MBA in Strategic Marketing. In addition to a comprehensive core that includes STEM courses, you’ll dive deep into the intricacies of marketing, from planning to implementing to managing marketing tasks. Whether you’re a mid-management marketing professional, salesperson, or advertising professional, you’ll enjoy this program’s relevant and robust curriculum. Take just one course per eight-week term and you’ll graduate in 26 months. Take two courses per term and you’ll complete your MBA in as little as a year! As an online student, you’ll be able to enhance your MBA through internships and through study abroad opportunities in China and Austria. You can’t go wrong with Concordia, which boasts a 90% job placement rate!